Thread: Picked up a new (to me) SS bike. Been running a converted geared bike SS for the last couple of years. Saw this on CL so I decided to snag it. I put the gears back on the other bike and listed that up on CL. 21 lbs of sweetness. Haven't taken it out on a ride yet but just riding i around the block feels gooooooood. Nice looking bike. Go get it dirty! Dude that is so awesome!! I wouldn't have sold the other one. When I bought my new Soma I put gears back on my Jamis. Haha I have a ton of bikes. And another hardtail so no need for duplicate bikes. Either way thats still an awesome bike! Especially from Craigslist. I never find anything around here but cheap garbage. Great looking bike. What frame is that? 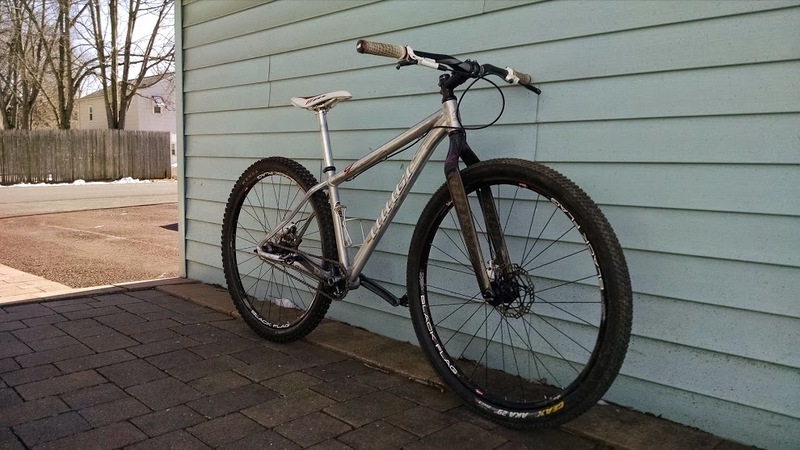 It's a Niner One 9 Scandium. There's plenty of good stuff on CL around here (Philly area) but a lot of it is priced really high. Well, maybe too close to retail for my blood. LOL. Once in a blue moon a good deal pops up. After you get a little time on it, I would be curious to hear your thoughts on the EBB. I recently had a similar frame with the Niner Biocentric 1 EBB. At well over 200 lbs I was expecting it to blow. It turned out to be really solid. If it ever slipped it was a tiny bit. Once the creaking started up, I would pull it apart, clean it, re-install it. I rode the frame for about 6 months with no issues. When I sold it the decision had nothing to do with the EBB. I had ridden a few other EBBs in the past that I was not happy with. Both of those frames were sold largely because of the EBB. Which frames were they and what type of ebb did they have? 2009 (I think) Salsa El Mariachi with a Bushnell EBB, and a Chinese carbon frame with a Beer EBB. With the Salsa I have issues with frame flex, and the EBB. With the Chinese carbon I had general issues with the frame being forced into being a single speed. The machined aluminum EBB and the aluminum frame insert would not play nicely together. Ultimately I had major creaking noises coming out of the frame. After breakdown, clean, reassemble it would last less than a ride before it was back again. I don't think it was really an issue with the frame or EBB. I think it was a combination of lots of issues. Nice bike! Why the Nevegal on the rear and Geax AKA on the front? I typically set my bikes up the opposite of that, with the faster rolling tire on the rear and grippy tire up front for turnin'. Curious if there is a valid reason to do the opposite. Haha, this was the set up the guy I bought it off of had. I swapped out to a Nobby Nic up front and a Thunder Burt in the rear. Edit: I'm thinking he just remounted the tires from his good wheels to these wheels to sell and didn't care which way they were mounted. So he probably didn't ride them this way at all. I know I wouldn't. Bwahahaha. I'll take an updated picture for your tomorrow. Have you had a chance to get it on the trail yet?? Nope! Can you believe it snowed here today? Gonna try to take the fatbike out tomorrow. And then after that melts, the trails will probably be a mess for a few weeks if it doesn't rain in the meanwhile. Just picked up this bike...what do you think? picked up new bike yesterday!